HONG KONG — Activists are protesting Hong Kong's disqualification of a legislative candidate on the grounds that she advocated self-determination for the Chinese territory. Lau Siu-lai, who was stripped of her seat in the Hong Kong legislature last year, was barred by the government on Friday from running in a Nov. 25 election. Hong Kong authorities are trying to quash pro-independence voices ahead of the election. Chinese President Xi Jinping and other officials have warned separatist activity will not be tolerated. The pro-independence Hong Kong National Party was banned in September by authorities who invoked a 1997 national security law for the first time. Pro-democracy activists complain Beijing interferes in Hong Kong's affairs in violation of its promise of a "high degree of autonomy" when the former British colony returned to Chinese rule in 1997. Some have called for more autonomy or outright independence for this prosperous business center of 7.5 million people. Authorities said Lau's statements in 2016 in support of self-determination were illegal. Lau dropped that call from her election platform, but the Election Affairs Commission said her views hadn't really changed. The decision "amounts to the political screening of candidates Beijing does not like," said Hong Kong Watch, a human rights group, in a statement. "The decision is in breach of the right to stand in free and fair elections," the group said. A group of pro-democracy legislators said in a statement that the government is "trying to use fear against dissident voices." The Hong Kong government defended Lau's disqualification as consistent with the Basic Law, the territory's de facto constitution. "Advocating independence" is "inconsistent with the constitutional and legal status" of Hong Kong, a government statement said. It pointed to Article 1 of the Basic Law, which says Hong Kong is an "inalienable part" of the People's Republic of China. On Friday night, Lau and a dozen pro-democracy activists protested outside the Hong Kong government headquarters and marched to the office of the territory's chief executive, according to The South China Morning Post newspaper. Lau, a university sociology teacher, accused the government of using disqualification to make sure pro-establishment candidates win. "What people will this administration allow into politics? Is it only those who kneel before them?" the Post quoted Lau as saying. 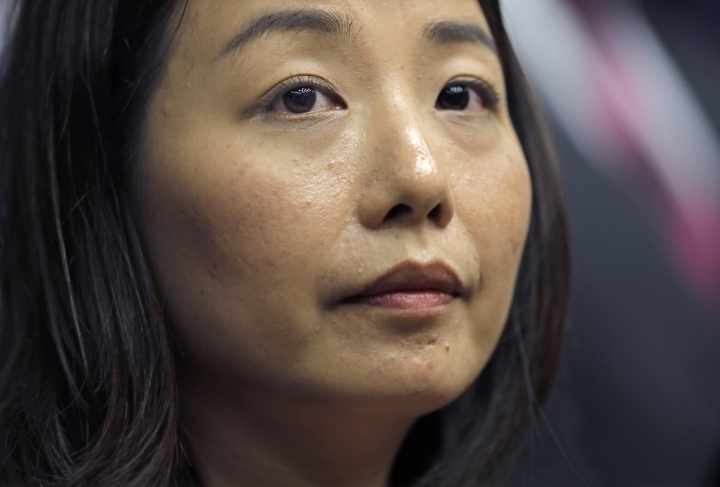 Lau complained election authorities "completely twisted" her views from 2016. Protests erupted in 2014 after China's ruling Communist Party said it would decide who was allowed to run for Hong Kong's leadership. Lau won a Legislative Council seat in 2016 but was barred by a court from taking her seat after she and other pro-independence members alterd the wording of their oaths of office. Lau was permanently stripped of the seat last year. Lau is the ninth person since then to be disqualified from running for office.